Submission deadline has been over as scheduled. Thank you for submitting your proposals for WONCA APR 2019. We have reviewed all the submitted proposals carefully, and are now pleased to announce the results. Regarding the details of your sessions including date & time, the Scientific Program Committee is finalizing. We will update information on our website by the end of January 2019. We sincerely appreciate your patience with this regard. 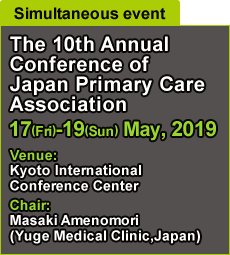 Thank you for submitting your abstract to WONCA APR 2019 Kyoto. We have reviewd all submitted abstracts carefully and we are now pleased to annouce the results. * We changed the "Number" of your abstracts. Please check your abstracts information on the list again. * In order for your abstract to appear in the program app., the presenting author must be pre-registered and registration fee must be paid in full by March 31st. Please go to Registration page to complete registration! * Please be sure to keep to the allotted presentation time in considerration of next presenter. * Please arrive at your session room at least 15 minutes before the session begins. The PCs equipped in the session room is Windows10. (1F Room H, Kyoto International Conference Center). We kindly ask all presenters to check in data at least 30 minutes prior to your presentation. Please prepare your data in Microsoft PowerPoint（Windows PowerPoint2010~）and make sure to preview your presentation data. Remote presentation system is equipped in the session room. You have a TFT monitor, mouse and USB keyboard on the podium to operate your presentation. Audio playback is not possible. Only USB flash memories and CD-R are accepted. *MOs, floppy disks, and CD-RWs cannot be accepted. Windows is the only operating system available for the presentations. *If you have prepared the presentation data on a Macintosh, you are requested to bring your own computer. Only Windows Media Player can be used to playback movie files. Your media should contain only the presentation data for the conference. Your presentation data file should be named as <Session Number> <Name> .ppt. If your presentation data is linked to other files (i.e. still or moving images, graphs, etc. ),　those linked files should also be saved in the same folder, and the links checked beforehand. The Secretariat is responsible for destroying all copies of any data after the session. The Secretariat will prepare a Mini D-sub 15 pin PC cable connector. If your PC is not compatible with this cable connector, please bring an adaptor to connect your PC to the Mini D-sub 15 pin PC cable connector. Please bring your AC adapter and converter with you. Please also bring your presentation data on a media (either on USB flash memory or CD-R) as a backup file. COI disclosure is required at both oral and poster presentation. Please report any conflict of interest (COI) in your oral presentation. We expect presenters/authors to be in front of their poster at designated time and discuss their poster. 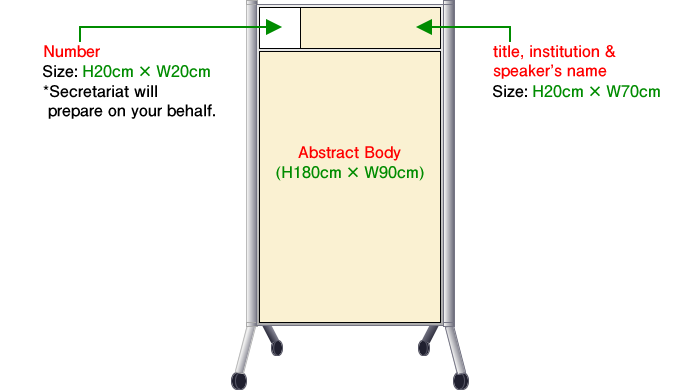 A poster board with the assigned abstract number located at the top of the board will be povided. Conference Secretariat will prepare and pre-set on each panel. Please prepare a label showing the title, institution and the speaker's name. Please summarize your abstract within the size mentioned. Please report any conflict of interest (COI) in your poster. If you or your institution has never received any payment or services from a third party (government, commercial, private foundation, etc.) for any aspect of the submitted work, please declare the following message at any place of your poster. I declare I have not received any payment or services from a third party for the submitted work. If you or your institution at any time receives any payment or services from a third party (government, commercial, private foundation, etc.) for any aspect of the submitted work, please include the following message at any place of your poster. I declare I have received payment or services from a third party,(OOO Company, OOO Center, etc. ), for the submitted work. © Copyrights WONCAAPRC 2019. All Rights Reserved.